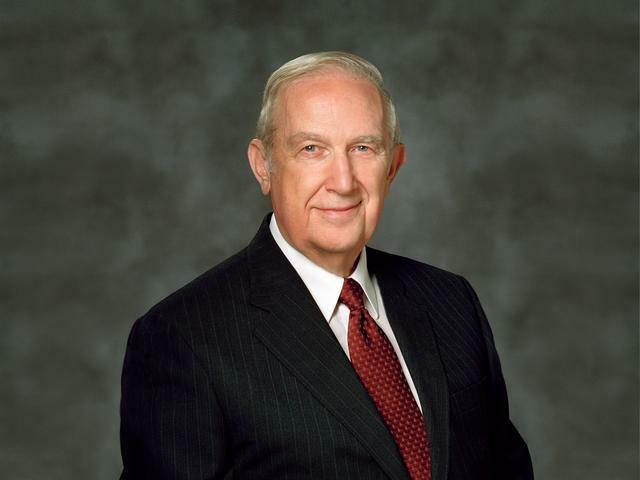 A third vacancy on the LDS Church's Quorum of the Twelve Apostles has just opened up as Elder Richard G. Scott passed away due to causes incident to old age on Tuesday September 22nd, 2015 at home surrounded by his family. Elder Scott was hospitalized in April 2015 due to gastrointestinal bleeding and after his release from the hospital, the Church said he had experienced a fading memory incident due to age, and was no longer fully able to participate in meetings of the Quorum of the Twelve at this time. UPDATE September 23rd: Funeral services will be held in the Tabernacle on Temple Square on Monday, September 28th, 2015, at 11:00 a.m. MDT. The funeral will be open to the public ages 8 and older. They will be broadcast live via MormonNewsroom.org and LDS.org, along with a host of other media sources. There will be no public viewing. Expressions of sympathy can be posted on Elder Scott's official Facebook page or emailed to condolences at ldschurch.org. In lieu of flowers, contributions can be made to the Church’s General Missionary Fund at give.lds.org/elderscott. UPDATE September 29th: On September 28th, approximately 2,500 people filled the historic Tabernacle to capacity for the funeral of Elder Scott, while many others attended the services in the overflow seating of the nearby Assembly Hall. Thousands more watched the broadcast live in English, Spanish and Portuguese on LDS.org and on the Church satellite system. The service, held under the direction of the First Presidency, was attended by general authorities and auxiliary leaders of the Church, as well as community and civic leaders and members of Elder Scott’s family. Church President Thomas S. Monson presided over the services, which were conducted by President Henry B. Eyring, first counselor in the First Presidency. Elder Scott served as an apostle since 1988. Before that, he served on the First Quorum of the Seventy beginning on April 2, 1977, and served as a member of the presidency of that quorum from October 1983 until he was called as an apostle. One of his most notable secular accomplishments was service working on Admiral Hyman Rickover's staff directing development of nuclear fuel for naval and land based power plants. On that team, he worked on the design of the nuclear reactor for Nautilus, the first nuclear-powered submarine, and on the first land-based nuclear power plant. Elder Scott was married to the late Jeanene Watkins, who preceded him in death in 1995. Together, they had seven children, two of which preceded their parents in death. It is quite likely that the successors to L. Tom Perry and Boyd K. Packer will be named and presented to the Church at the upcoming 185th Semiannual General Conference to be held on October 3-4. There's also a possibility that a successor to Elder Scott will also be named at this time despite the recency of his passing. Through the power of revelation, the successors will be identified to President Thomas S. Monson, who will then convene the remaining quorum members to ratify the selection. Read more about this process on LDS.org. Nevertheless, it is natural to speculate on the identity of likely successors. And such speculation is harmless so long as it does not cross the line into formal campaigning for a specific person. Since most apostles are selected from the First Quorum of the Seventy, it is only natural to look there first. The Church is also looking to diversify its senior leadership, although it uses diversity as a means to an end rather than an end unto itself, so Seventies from Latin America, Asia, and Africa may get a closer look than usual. -- Elder Ulisses Soares. A Brazilian national, Elder Soares is not only a member of the First Quorum of the Seventy, but is also a member of the seven-man Presidency of the Seventy. The length of Elder Soares's service, his relatively young age (57), and the strong growth of the Church in Latin America and particularly in Brazil make him a most attractive candidate. By selecting Elder Soares, the Church will signal to Latin Americans that they have finally "arrived" in the upper reaches of Church government and will give them a living symbol to further burnish their testimonies. -- Elder Ronald A. Rasband. An American born in Utah, he also serves in both the quorum and the presidency. Elder Rasband not only gains visibility by his frequent Conference talks, but on September 15th, gave an important talk at BYU-Provo about religious liberty. The timing of this talk, so close to General Conference, opens up speculation that the Church was "showcasing" him. -- The third choice is a bit tougher. The Church could play it safe and select either L. Whitney Clayton, Donald L. Hallstrom, or Richard J. Maynes to fill an apostle vacancy. All are veterans of lengthy service as seventies. If the Church desires to promote an Asian to the apostleship, it could select Yoon Hwan Choi, who is comparatively young. A real wild card would be Joseph W. Sitati, a native of Kenya who not only has served as a seventy for over six years, but is currently the editor of Ensign, Liahona, New Era, and The Friend magazines. While the LDS Church is not as numerically strong in Africa as it is elsewhere, it it growing fast in some sections, and the selection of an African apostle could jumpstart Church growth there. Costa Rica media sources have been reporting this for the past two days, but were withholding the name of the decedent. Now the Deseret News is reporting that 20-year-old Elder Ricardo Alberto Cuevas Magdaleno, a missionary serving in the Costa Rica San Jose East Mission, passed away in his sleep of unknown causes sometime during the night of July 14-15, 2015. Elder Cuevas was from the Xalapa Mexico Stake. His companion, who was also from Mexico, was not identified. But the Costa Rica Star (English) published additional details in their July 16th story. Elder Cuevas, a veteran of six months mission service in Sarapiqui in northeast Costa Rica, has been approved for his mission despite suffering from chronic asthma and other pulmonary issues; he had a supply of medication on hand. But he originally requested the Sarapiqui area because he felt that's where God wanted him to serve. On the evening of July 14th, Elder Cuevas told his companion that he had not felt well in the last few days, and decided to skip the customary end-of-day briefing and Bible study. His companion offered to take him to the hospital, but Elder Cuevas declined, saying his life in God’s hands. In the morning, when Elder Cuevas failed to emerge from his bedroom, his companion entered and found he had passed away during the night. First responders rendered a preliminary diagnosis as a respiratory arrest, but the medical examiner will make the final call. Diario Extra also published a story (Spanish) which can be easily translated using Google Translate. Elder Cuevas developed a reputation as a kind young man who always traveled on foot or bicycle, wore buttoned-up and crisply pressed white shirts, and who was very respectful and passionate about his religion. He is the fourth LDS missionary to have given his life in service to the Lord while on a mission in 2015. Note: LDS members are allowed to serve full-time missions with chronic medical conditions if a physician certifies their ability to serve and ensures they know the medications they need to stabilize and control their condition. It is the missionary's responsibility to ensure he or she has the medications available. At the funeral of President Boyd K. Packer held in Salt Lake City on July 10th, 2015, LDS Church President Thomas S. Monson noted that President Packer left a legacy of Christ-like service and love. He and other speakers also characterized President Packer a talented teacher, scriptorian, artist, example, friend and leader. President Packer died at home on July 3 at the age of 90 after serving as a general authority of the LDS Church for just over 53 years. The funeral was held at 11:00 A.M. at the more traditional Salt Lake Tabernacle on Temple Square rather than at the more modern Conference Center. And yes, although President Packer was an Apostle, he was also assigned to a home ward and home stake, and, in a touch of class, his bishop and stake president were invited to join the other VIPs up on the stand. Speakers included President Monson, President Packer's son Elder Allan F. Packer of the Seventy, and Elders M. Russell Ballard and Dallin H. Oaks, both of the Quorum of the Twelve Apostles; President Henry B. Eyring, First Counselor in the First Presidency, conducted the service. 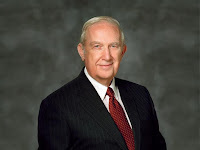 It was also reported that the most senior-remaining apostle on the Quorum, Rusell M. Nelson, has assumed the duties of President of the Quorum. -- The first 38 minutes consist of music from the Mormon Tabernacle Choir. -- At the 38 minute point, the motorcade pulls up. The casket is removed and escorted into the Tabernacle by the VIPs. -- At the 58 minute point, the service actually begins, conducted by President Eyring. A private burial service took place at the Brigham City Cemetery following the funeral. There will be no public viewing. In lieu of flowers, the apostle's family has asked contributions be made to the LDS Family History Center. Donation instructions are available at LDS Philanthropies.